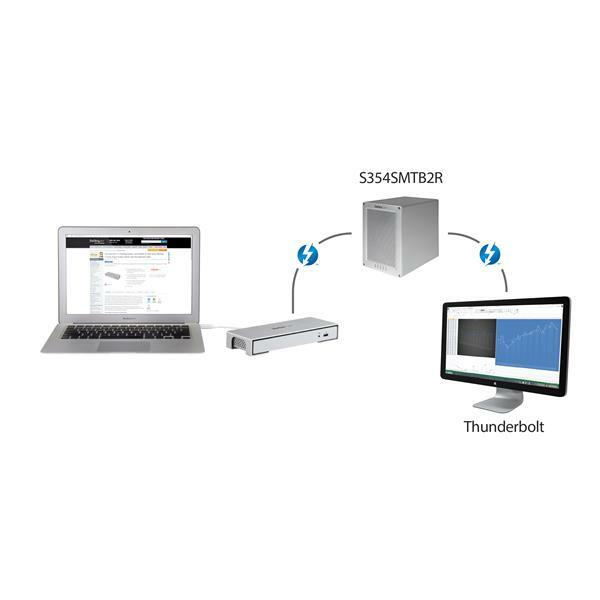 Quad-bay high capacity storage with lightning fast performance. I needed to connect two displays and several peripherals to my Mac Pro. This device works great and solved my problem. Unit arrived yesterday. I plugged in monitor (via Thunderbolt port), MacBook Pro (15" w/ Retina display running OSX 10.13.6) and two peripherals. Everything worked as soon as the unit was powered. Also charged my iPhone This all took no more than five minutes, including the opening of the box! Yes, plug and play as described. Looks great, too. 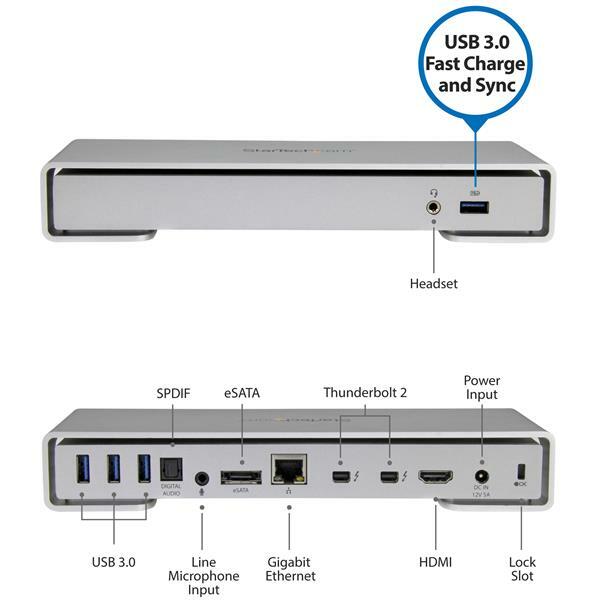 The Thunderbolt 2 4K Laptop Docking Station is a great compliment to my Apple MacBook Pro Retina. This polished silver looks good on my desk and with the HDMI & Thunderbolt outputs I can run dual monitors. 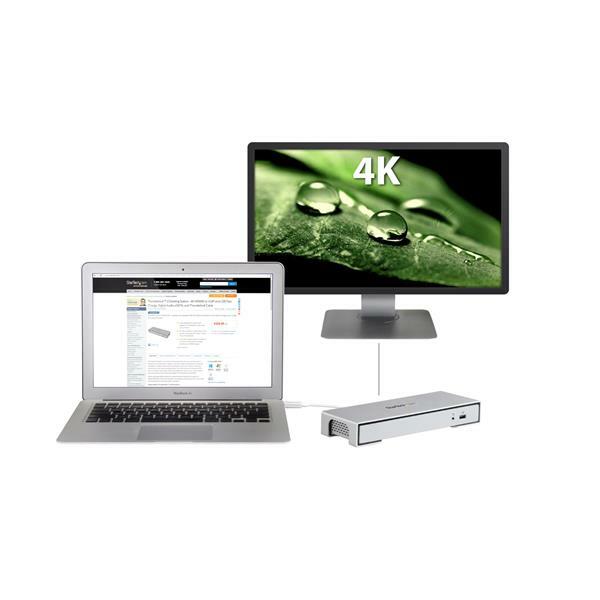 The 3x USB 3.0 hub ports are used daily for external drive, iPhone/iPad and Logitech HD Pro Webcam . Thank you for taking the time to share your experience with the TB2DOCK4KDHC docking station. We appreciate your feedback and want to help. On macOS 10.9 and newer this dock is Plug and Play, and doesn't require any additional driver installation. In regards to the video issue, could you let us know the types of monitor you have and if you are using any adapters with the dock? Please also note that a dual monitor setup can only be achieved when using an HDMI and a true Thunderbolt Display simultaneously. Our products include free lifetime technical support, so if there are any additional questions or concerns, please get in touch with us. We bought this at work for my Macbook Pro and external monitor (acer B326HUL). It doesn't work plain and simple. We sent it back and they gave us a replacement and same issues. It doesn't communicate well with monitor, so we still have to plug into laptop. I've talked to tech, and their tech support and still nothing. Also, seems to have issues with audio. It will occasionally switch between headphones and internal laptop speakers. A dud. I'm literally looking at it right now, and asking myself 'why is this on my desk?' I use another brand at home on an identical set-up and do not have these issues. Thank you for your review of TB2DOCK4KDHC. We're very sorry about the ongoing issues you've experienced with it. With flickering issues like those you've had, we suggest resetting the NVRAM and SMC of your MacBook Pro. Another great step is to ensure your MacOS is fully updated. We recommend contacting directly so we can help resolve these issues as quickly as possible. Our Technical Support Advisors can be reached 24 hours a day, 5 days a week at 1-800-265-1844 or at https://www.startech.com/Chat. Please refer to your case number, 306-5800909, when you contact us. I concur with all the above reviews on the solid build, good looks and excellent functionality of this dock. I have it installed on our office's main boardroom for guest connectivity to our video display system and it works well and looks great. I know this isn't the main purpose for this dock, but it would be all that better if it had two HDMI ports. Contrary to a review above, I don't think it needs more than 2 thunderbolt ports because Thunderbolt devices should be able to daisy chain. Every TB device should have two ports to pass the signal through, displays and storage devices as well. I received this product in exchange for an unbiased review. I am happy with this docking station except that I wish I could plug in two monitors. Currently, the station only supports one. The other monitor's connector plugs directly into my laptop. Almost there, but not quite. Hello, Thanks for sharing your review with us. The Thunderbolt dock can take advantage of two displays if you have a compatible computer. To use two displays the dock can connect to an HDMI and a Thunderbolt display. Please note that you cannot use a mini DisplayPort display in place of the Thunderbolt display, despite using the same style connector. If you have any further questions, please let us know. The DC adapter doesn’t run hot and it comes with 4 power cords that accepts North American, European, Australian and UK power sources. These are big heavy cords, which is good but bulky, so make sure you know which cord you’ll need before traveling. Unfortunately, they’ve missed a very important feature that would make this a great system. A power connection port for the laptop itself. Users want to carry less cords not more, so the fact this system needs additional power to run your laptop is very disappointing, so you still have to carry around your heavy power adaptor and cord. Even though there’s power going through the docking station, unless your laptop is powered on, you can’t use the rear 3 USB ports to charge your peripherals. Only the front USB 3.0 fast-charge port works without a computer connected and turned on. A sorely missed opportunity there. When connecting a desktop scanner to one of the rear USB ports, it works beautifully. On a Mac, I was able to use the very under-utilized, under-appreciated Image Capture app that comes with every Mac. The Gigabit Ethernet port works as it should and easily connected to my work network without any fuss. I was able to use Siri running OS Sierra 10.12.2 on my laptop with my audio headphones plugged into this port, however, I’m picking up some annoying and constant high pitched buzzing from my headset. When I tested it against the headphone plug on my laptop, there was total silence where there should be. There are only 2 Thunderbolt ports on this unit. One is taken up connecting your laptop to it. 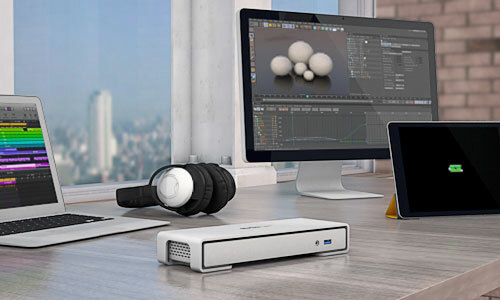 The other port can be used to connect a Thunderbolt monitor, but then there’s no extra ports for Thunderbolt hard drives, so you’d connect have to connect it to your laptop. If they added at least one more port, or better yet, two, it would truly make this an ideal docking station. 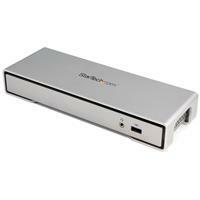 The HDMI port works as expected and will connect to your TV or external monitor. 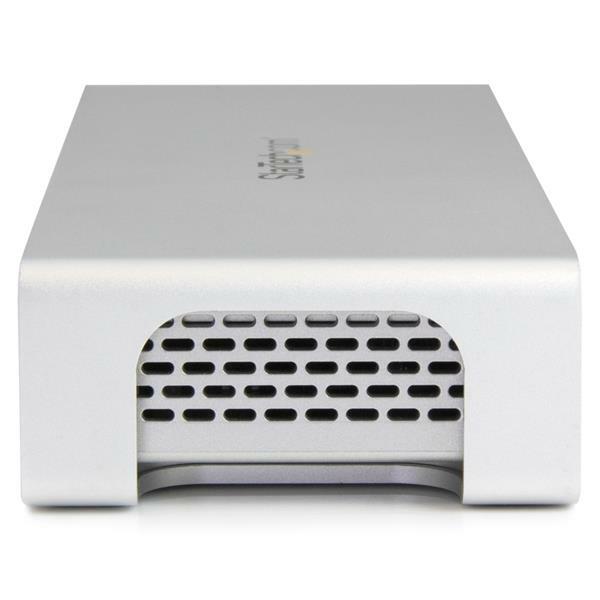 When connecting the StarTech docking station to an LCD projector using the HDMI port, the Mac will recognize the model type and will optimize display output accordingly, and will also play sound through the unit as well, if equipped to do so. The unit itself is built solidly and dispels heat sufficiently, even when using several peripherals at the same time. The design is eye-appealing and will compliment your aluminum Mac laptop set-up. Not overlooked and always appreciated is the included thunderbolt cable, especially in this, ‘not included’, consumer world. 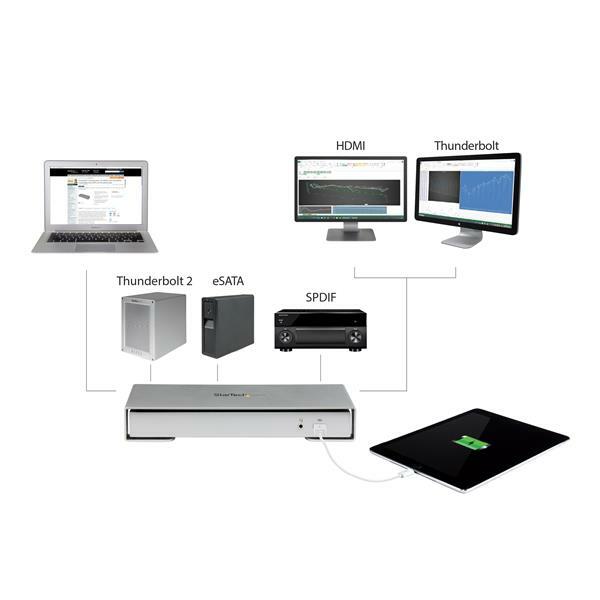 All in all the StarTech Thunderbolt 2 4K Laptop Docking Station is a good unit, but to make it even better and a true docking station, add a power port to plug our laptop into, and add one or two more thunderbolt ports to make this a killer go-to docking station. I received this product in exchange for an unbiased review. 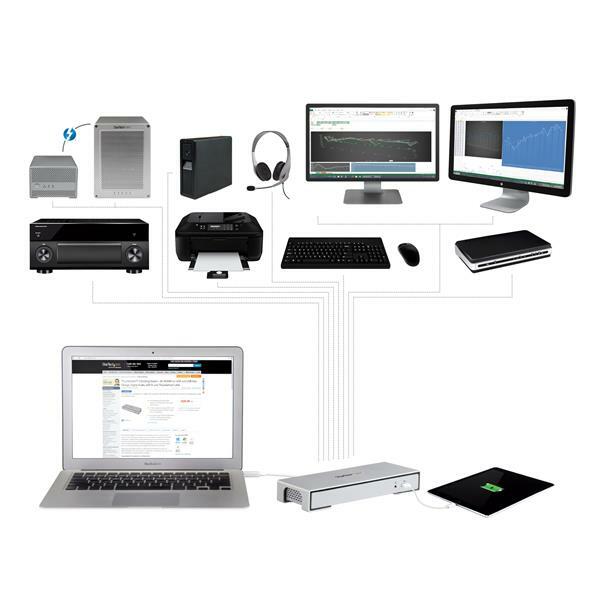 I have been in the technology business for over 35 years and for the past 20+ years I have been asked to provide unbiased reviews of various products from both the AV and IT world. In review of this product I liked that it supported a wide variety of display configurations and resolutions which are common for working in a normal computer 16:10 format, with the accompanying audio. StarTech thought through and supplied the perfect amount of USB connections (3 in the rear and 1 in the front). The unit also worked well in dual monitor mode. The ease of use was well thought through, simply plug in the laptop and display and the unit does the rest. 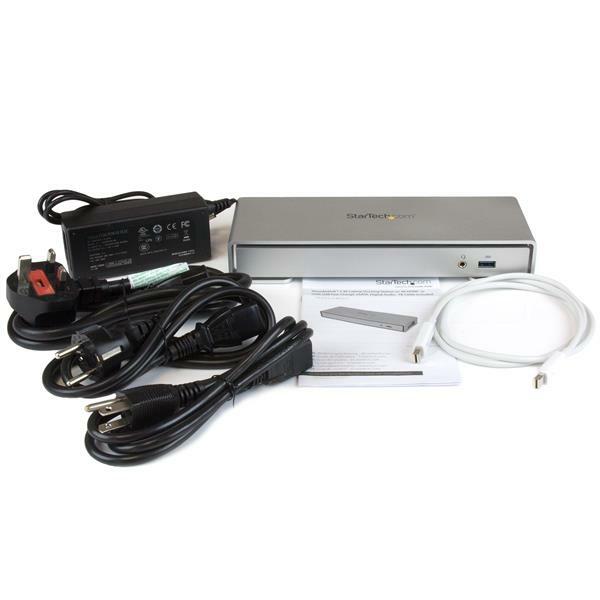 In the box: -Thunderbolt 2 4K Laptop Docking Station -1m Thunderbolt Cable -Universal Power Adapter (NA/UK/EU) -3 Power Cords (NA/UK/EU) -Instruction Manual In summation, solid product, multiple connections, well planned front USB charging, easy to set up and use. I received this product in exchange for an unbiased review. 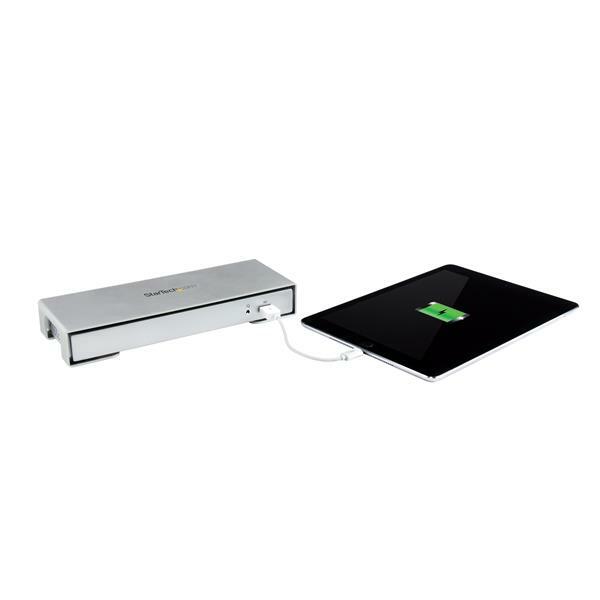 (5 stars) Mac fans will love this dock. 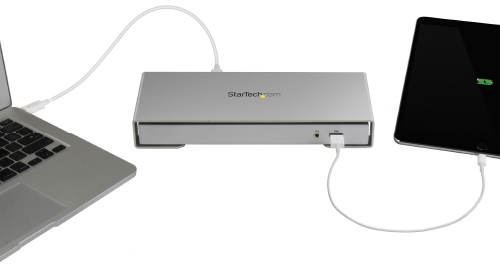 The Thunderbolt 2 4K Laptop Docking Station was a perfect compliment to my Apple MacBook Pro in build quality and color. This silver polished look matches well on my desk and with the 2x Thunderbolt outputs I can run dual monitors up to 4K at 3840x1440 resolution. The 3x USB 3.0 hub ports will be used daily for external drive, smart card reader and iPhone hookup. Apple is trying to make us all go wireless but in the world I live in there is so much connectivity to other devices that don't play that game. 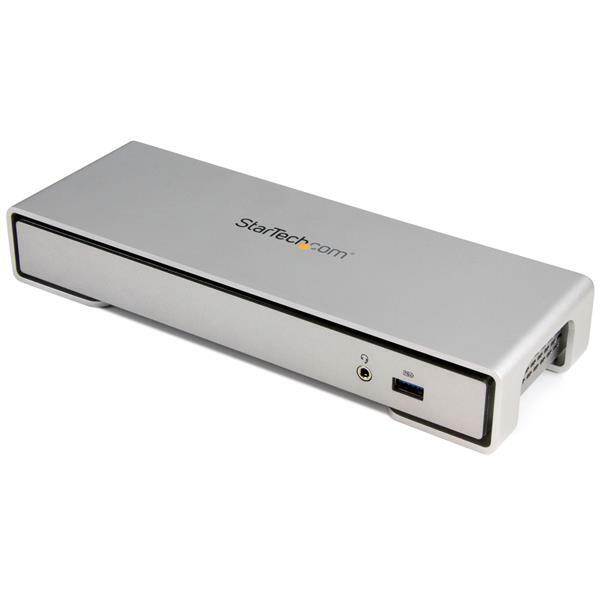 Startech's Thunderbolt 2, 4k docking station satisfies those needs for me perfectly and at a super reasonable price. It even includes a Thunderbolt cable. No Audio most of the time since El Capitan Upgrade on my iMac. I'm using every port on this device flawlessly. 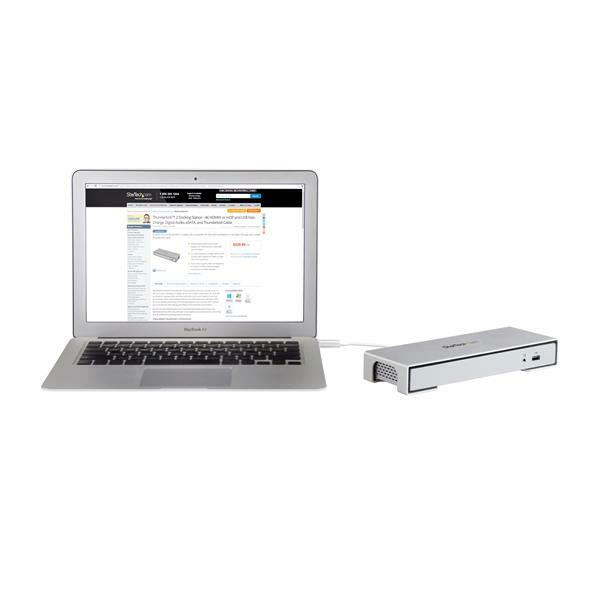 If you have legacy gear that needs to connect to a thunderbolt mac, this is the product for you.